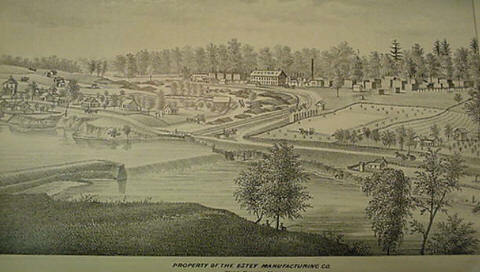 The Estey family originated from Brattleboro, Vermont. 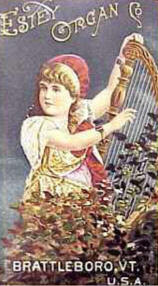 They were renowned organ manufacturers. Third generation, David M. Estey, with the backing of the Estey Co., moved to West Haven (New Haven Twp., Shiawassee County) in 1865. The village of West Haven was developing quickly as a Mr. Quackenbush had dammed the six-mile creek and built a saw mill there. David Estey and E.E. 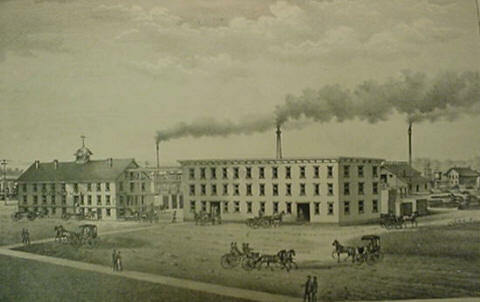 White planned to build a factory and by 1869, they were manufacturing bedroom furniture. 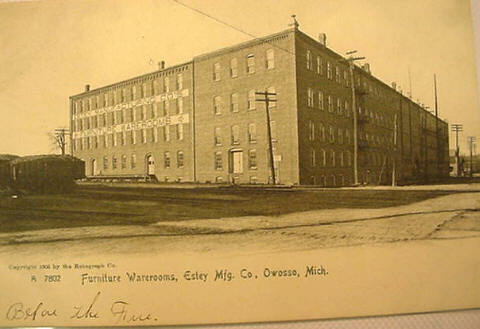 By 1875, Mr. Estey decided to expand the business and move to Owosso, who had offered him $3,000 as an incentive. He sold the West Haven factory to a family named Callard and moved to Owosso. In 1893, the Governor of Vermont came to visit David in Owosso. He was a large shareholder of the Estey Co. in Brattleboro. 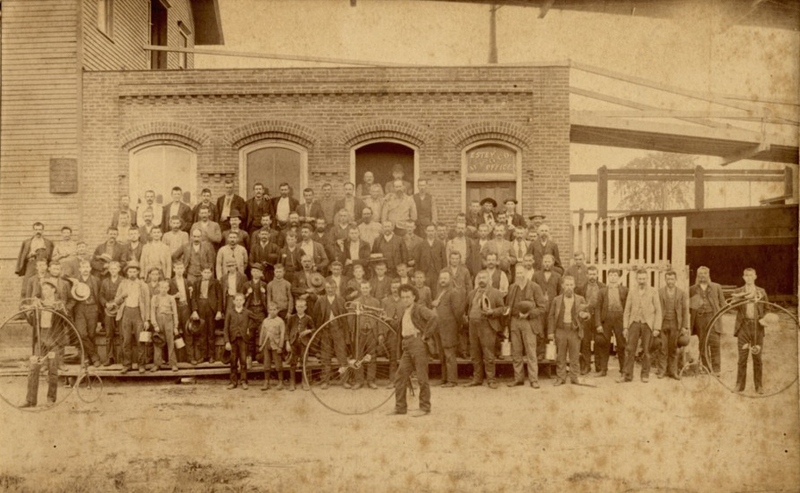 David was mayor of Owosso in 1894 and quite successful, as he owned nearly 12,000 acres of timber land in Gladwin County, a mine in New Mexico and was half owner of the Queen Cart Company and the Estey & Calkin's Lumber Company of Pinconning, Michigan. In the 1896 Owosso City Directory, David is listed as President of Estey and also the Owosso Land, Lumber and Fuel Co. Limited. Advertising Lands, Lumber, Logs, Timber and Fuel located at 400 S. Washington St.
David died on Sept. 27, 1903 in New Haven Conn. He is buried in Oak Hill Cemetery. 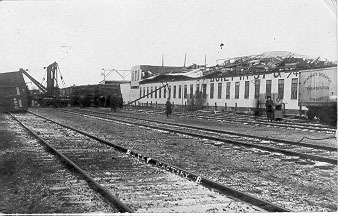 During the night of May 18, 1906 Factory A was destroyed by fire. The building was a complete loss with insurance expected to cover only about $126,000 of the $225,000 loss. In spite of efforts by the Owosso and Corunna fire departments, a south wind fanned the flames, and they were unable to save the building. Other nearby buildings were also damaged, but not destroyed. Plans were made to rebuild while production continued in Factory B, but they did not materialize. The photos above show the factory before and after. Factory B, also known as the White Elephant, was built in 1897 in approximately 57 hours. It was a three story frame structure with a basement. 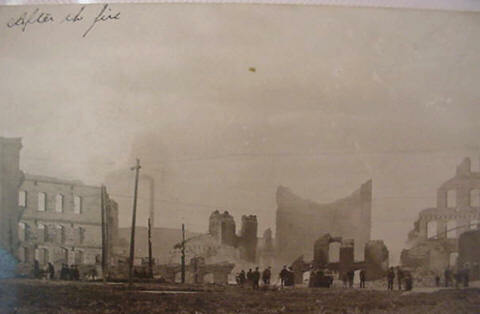 Unfortunately, tragedy was to strike the company again when a tornado damaged many buildings in Owosso and reduced the factory to a pile of lumber on November 11, 1911 at 11:00 pm. The company carried no insurance against tornados. 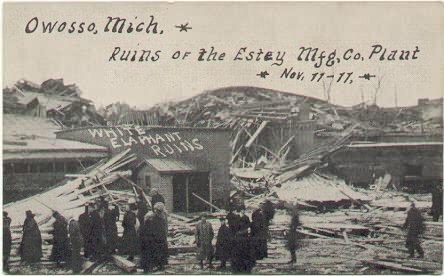 In 1909, Charles Rigley bought out Estey's share of the company and reorganized it in 1912 after the tornado. The company again began to make plans to rebuild. A. M. Bentley, manager of the Reliance Motor Truck Company and a director for General Motors, offered to return $12,000 to the city which had been appropriated for an addition to his company. Rigley turned down incentives from other Michigan cities to remain in Owosso. He continued it's operation until he retired in 1921, at which time he sold the business to Bert A. Hathaway of Grand Rapids. The 1924 Owosso City directory lists Burt A. Hathaway, President. 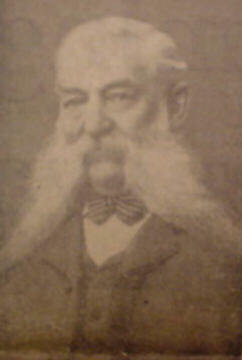 Charles Rigley, V.P. Mr. Rigley had served as President of Owosso Savings Bank for many years. He died in 1928. This company ran into financial difficulties during the depression and by 1939 was facing bankruptcy. All assets were disposed of and the property sold to pay off some of their debts. 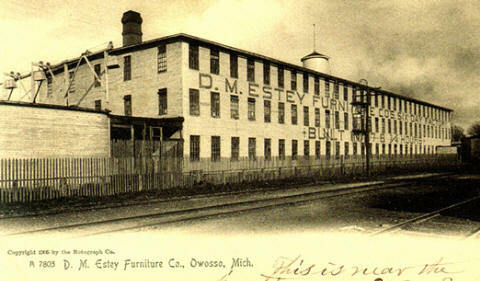 Estey furniture was a quality made product. 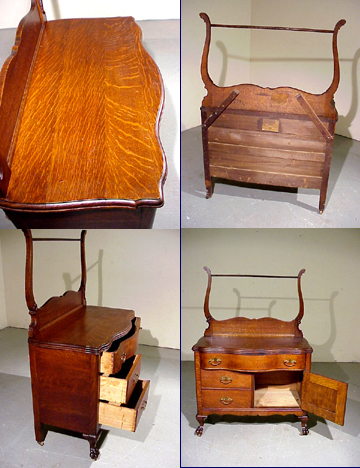 Below is a Victorian oak wash stand dating from the early 1900's. It features a serpentine shaped front, a multiple beveled edge on the beautiful top, and the original stylish carved towel rack. 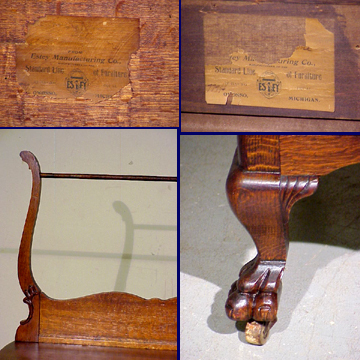 It has a large serpentine dovetailed drawer in the top of the case, two flat dovetailed drawers on the side, a picture frame molded panel door, and it is finished off with detailed claw feet. The overall size is 36" wide x 18" deep x 31' high the top of the base, 55" high to the top of towel rack. The size of the serpentine dovetailed top drawer is 31" wide x 15.5" deep x 4.5" high. The size of the two flat front dovetailed drawers are 14.5" wide x 13" deep x approximately 5" high. Upon opening the panel door, it exposes a storage cavity that is 16" wide x 16" deep x 13" high. It is finsihed in the original medium oak stain which has naturally aged to produce a beautiful patina over the last 100 years. It even features solid oak panel sides and retains the original Victorian brass hardware. Notice: This website does not appraise furniture.